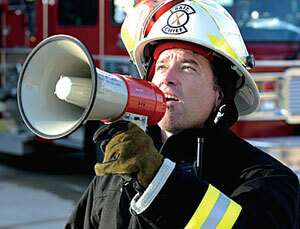 Megaphones help team leaders, coordinators, and first responders communicate important emergency information and instructions to both small and large groups of people. Megaphones are battery operated and amplify a voice so that people far away can hear. Generally speaking, the higher the wattage the megaphone has, the more distant the voice will travel. If you are the position of needing to communicate emergency information, then a megaphone is an important piece of equipment.